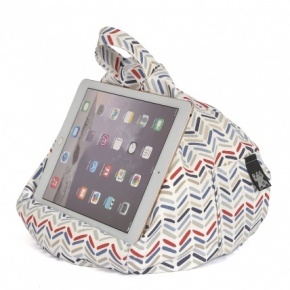 The iBeani is as exactly as it describes itself on it's website, "a tablet bean bag." However, get over the strange fact that you what you have is slightly under-filled cleverly shaped bean bag and you find that this little iBeani actually really works - and better than that, it works for my whole family. By being in our home for the past two weeks the iBeani has been put through it's paces. Here's what we've discovered. The iBeani is really stable. We've tried it on all sorts of surfaces; the sofa, the kitchen table, on kids laps in the car, in between the kids in the car, on the floor, in the kids beds, precariously perched on the arm of the tub chair and it's kept the watched device stable. The only difficulty it had was on some angled slippery surfaces like the sloping leather arms of the sofa but then it was just easier to move it onto your lap or the sofa itself. The iBeani makes it easy to watch from any angle we tried. Because it's a bit like getting comfy in a bean bag, your device can be squashed and moved around to face whichever way. The iBeani is fun. Ok, it's a bit of an odd one. David, who admittedly spent most of the time with the iBeani has definitely played with it. As part of his autism he is very hyposensitive - he enjoys pressure and feeling things. He's squashed it and sat on it and even had a game of catch with it. The iBeani stood up to his games no problem. The other fun part is that it comes in lots of designs. We got one that was multi-coloured so I wasn't constantly aware of any grubby hand prints, but they have a whole range of designs and fabrics. The iBeani felt safe. If it was pushed over no one got hurt. If it was used as a weapon, still no one got hurt. It has an easy carry handle so it's easy to move about (or throw in some cases). It seems sturdy and well made. There is no inner bag for the 'beans' which I thought there might be in case it needed washing, but the bag is fitted with a really efficient double safety zip to prevent the beans coming out. Honestly, I tried to get the zips undone for about five minutes and got absolutely nowhere. The iBeani is spot clean only. It's not meant to be machine washable. Apparently this is because should something happen and the beans escape in your machine you could have problems with your washing machine. I stuffed mine inside one of the kids fabric PE bags to be on the safe side and it washed just fine on a hand wash cycle. But, to be accurate, the label says is spot clean only and not to let it ouch other fabrics whilst drying. Best of all the iBeani is really simple to use. Put it down and pop on your device at the angle you like - done. As a non verbal child autistic child, we can't always communicate with David. He will often refuse to be shown how to use something and anything too complicated is rejected. But there was nothing to fiddle with, or balance or pull out to 'work' the iBeani. Most of our devices have protective covers, several of which came with stands. We have not been able to use any of them. David understood how to use the iBeani instantly. Overall, the iBeani has been most useful for my son, particularly when he has needed some sensory input. David has been able to watch an iPad comfortably without looking down at his lap all the time and can bash and bump the iBeani as much as he likes without changing his view. It's also been really useful in the car, as it's meant he's not had to be looking down to see the ipad, it can be on his lap no matter in what position he has his legs or even if he's jiggling about. Additionally if it's put in the middle seat of the car, David can watch it while holding onto something else, like a sticky flapjack, lolly or even his school bag. Along with it's carry handle, the other feature is it has a pocket for headphones etc. The kids have never used the pocket and on the odd occasion I've been allowed to use one of our many devices I found it handy for storing my glasses, I just had to remind myself where I'd put them afterwards. You can buy iBeani's, which are made here in the UK, direct from the company, currently priced at £24.99. Although I thought this seemed expensive for a stand I looked online and found that although at the higher end of the market there were stands more expensive. I've been really impressed with the iBeani and I've offered it to our son's special educational needs school to try out too. My only concern is I'll have to give it up for a week and I've got quite used to having it around. Super useful in the car. Kids have used it then fallen asleep on it. Fab! It's so great to actually find something that works for the kids. Thanks for stopping by. Definitely.. But will give it up to the school to try for a week soon. Seems only fair when something works well to share it about. Thanks again! This looks really good. Im always getting too hot a lap from using mine so def something ill look into it. Thanks Aby. I might need to check this... were you trying to tweet it? Thanks for hosting and commenting!